ARC'TERYX Osanna Coat. Designed to move freely through urban environments, the Osanna pairs the windproof, water resistant, breathable performance of GORE-TEX THERMIUM with Coreloft synthetic insulation for lightweight warmth. 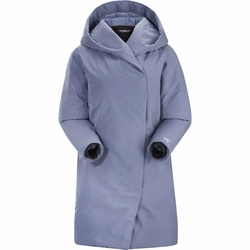 This cocoon coat closes with snaps to keep the drafts out. An insulated adjustable hood adds warmth and protection. Materials: N60p GORE THERMIUM;Coreloft 140 (140 g/m2) insulation. Made with highly crimped multi-denier siliconized polyester yarn, this lightweight, breathable, and thermally efficient, 100% polyester staple fiber is very compressible and has excellent loft retention. | Teprine 100% nylon 6,6/1.2oz/yd2, 42gm2 . This strong, lightweight 20D ripstop taffeta features a high density down proof construction and nylon 6,6 for tear resistance.